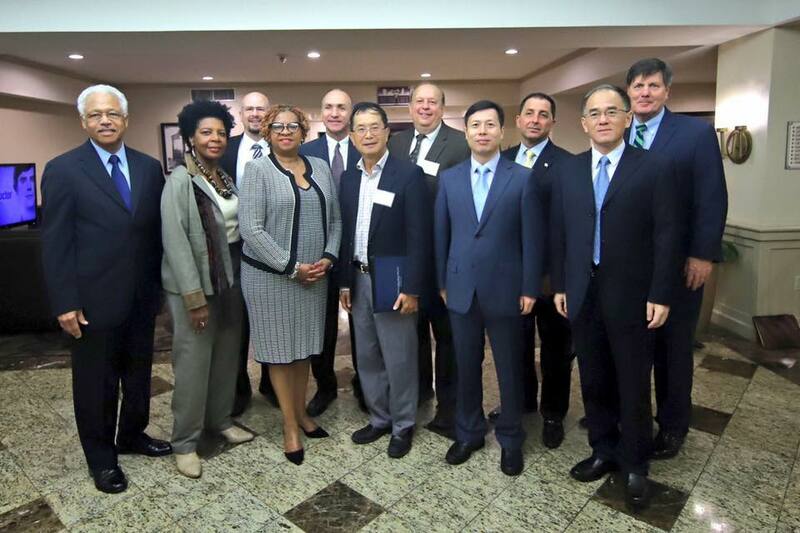 WILMINGTON – President Hanifa Shabazz was joined by Wilmington Cultural Affairs Director Tina Betz and Tom Ogden, Deputy Chief of Staff for Mayor Michael Purzycki as they greeted a delegation of education experts from Ningbo, China. The delegation was made up of a diverse mix of government leaders in education and foreign affairs, administrators and instructors representing high schools, vocational high schools and universities. A total of 26 delegates spent the day visiting schools, including Cab Calloway and Wilmington Charter. The visit was organized by Dr. Floyd Ho, Volunteer – Retired Chemist and Educator, Board of People-to-People International of Delaware, Ningbo Visit Volunteer,Tonya Richardson, Mayor’s Office of Cultural Affairs, Dennis Scheer, Sister Cities Wilmington, Primus Poppiti, President of Sister Cities Wilmington Board of Directors, Dr. Robert Andrzejewski of Innovative Educational Associates (IEA) and the Hon. Ted Blunt, former president of the Wilmington City Council.